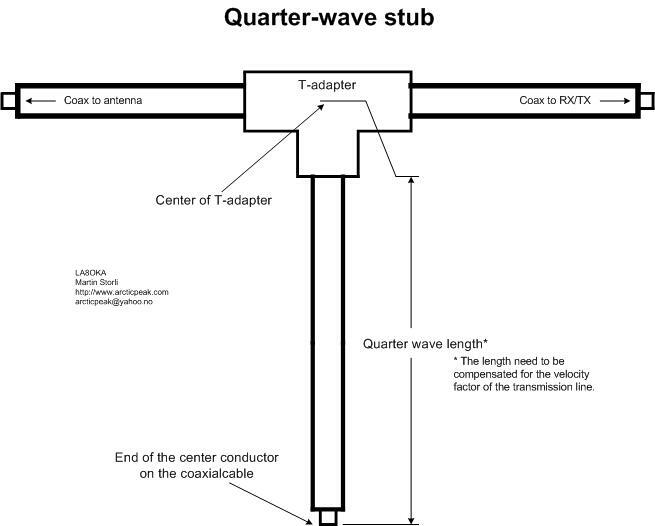 The Quarter-wave stub can be used for many purposes. If it is left with an open end it can be used as a notch filter to attenuate certain frequencies. A quarter wave length of a transmission line can also be used as an impedance transformer, to know more about the Quarter-wave impedance transformer, click here. The bandwidth of a quarter-wave notch filter is about 20 % (i.e. center frequency +/- 10 %). Be aware of the fact that the Quarter-wave notch filter will not only attenuate the design frequency and the frequency band around the design frequency, but it will also attenuate the frequency band around the odd harmonics of the design frequency. The velocity factor of RG-58, RG-59, RG-174, RG-213 and RG-214 is 0,66. The velocity factor of an open uninsulated wire is 0,95. Other transmission lines have other velocity factors.